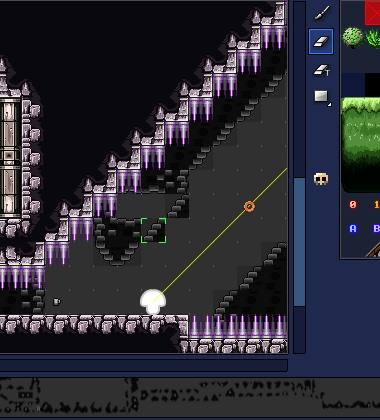 Above is a small picture of the level editor for Super QuickHook. Hook Champ and SQH more or less used the same level editor that we made. It's a tile-by-tile editor, you have to place every tile or delete every tile manually. Entities (steam jump vents, rocks you can kick around, coins) also have to be placed one at a time. The one nice shortcut the level editor has is that it converts the appropriate tiles to corner tiles automatically. All the possibilities of where the hook latches has to be accounted for. Different people, of different skill levels and styles, have different latch patterns. A latchable ceiling made too short or too long can have people plummet frequently on a jump that is not intended to be difficult, or just feel awkward. Due to the above point, each level has to be playtested and tweaked over and over. This repeats many times during the process of creating each level. Each level has to offer something different, in terms of gameplay design. This is difficult without any sort of combat or enemies. Each level has a "secret coin path" that must be designed alongside the normal path. As we talked about last week, Super QuickHook will be the last strictly hook-racing game from us. This is mostly due to the difficulty of level design. You'll see us move more towards combat in upcoming titles. Except for the next game (a quick, 99 cent experiment), we're not getting rid of the grappling hook. It's practically our trademark now. We're just making it more of a climbing tool, rather than an incredibly fast method of transportation. Interesting. Have you considered downloadable (and ratable, of course) levels that you can submit online? That would free you up to make more games while the players make the levels for you. The problem is that we'd have to make a bunch of complex systems for rating/distributing the levels. Another problem is having a detailed level editor approved by Apple, considering you can write whatever you want in tiles. Even if we figured out both concerns, we'd have to make a whole new game to justify the development time. We considered making a 99 cent game that was just an avalanche-like mode, then a make-and-share level editor. Briefly considered. We might revisit the hook-racing genre later, but it would be much later and probably for a different platform. Hmm, I guessed this is how you made your levels this way. a lot like Knytt Stories, minus the Grapple Hook. So Kepa, did you write this program yourself? And how do you get it into SQH/HC? A different platform eh? What other device do you plan to bust out the pixelated joy on? Jeremy Orlando does all the programming, and he made the level editor. It just converts the levels into data that is uploaded to a server. The beta copies of our games download these levels on the fly, for quick playtesting. A non-mobile platform. Xbox? PC? Who knows. Porting old games to other mobile platforms isn't out of the question, either. Will you release the editor to the public or at least make a video of it in use? you could use the iTunes file sharing capabilities to load in custom levels... no need to figure out a complex distribution model that requires Apple's approval. Not a lot of point, considering the editor doesn't really work without some way to put the levels in the game itself. We've considered that. Wolfenstein (or was it Doom?) for the iPhone did something similar. You'd just upload your level to an URL, and then visit put the URL into the program to download it directly. That makes it possible, but also so clunky that most people won't use it. The people willing to play/make custom levels without some sort of easy-sharing/rating setup would be a small percentage of total players. If our % of total players keeps surging up like it's been doing, we might be able to put it on the table of feature requests. No promises, though. There's a lot of things we want to do with SQH updates; we have to carefully choose which will be liked by the most people, against how much effort they'll take to create. When will the 2nd update be submitted? And the reason to release or make a video of it would be so people could at least see how it works without just a photo and description. Also with a jailbroken iPhone/iPod you could possibly add in your own levels made with the editor. Or I could hex edit them. I would have to learn the file structure and then I could possibly make my own editor. Are the levels stored in the .app folder as resources? Second update was already out that day, I believe. A video wouldn't really show much that the photo/description didn't. It's pretty bare bones. The jailbreaking to make your own levels sounds ambitious, though we can't devote any time towards helping with that. Yes. I've gotten the second update. I'm stuck on Lethal Halls now. When are you going to post news about the 2nd update? Also what does the message the fish tell you mean in the credits level? I really wish you could make it into the game, even if you couldn't upload/download user-created levels. Would it be that difficult to get it approved by Apple if it doesn't feature any online sharing? Another option for you guys is to simply add it as a feature that costs $1.00. I've seen games do that kind of thing before. Either way, I think it would definitely be awesome if you could feature it in the game. Actually, if you already have the program for level-editing, I would think it wouldn't be hard to transfer it over to the game. The hardest part, I would think, like you said, would be getting it approved by Apple. If you could manage to get level editing (even if it had no sharing levels online) in that game, I would in a heartbeat play a buck to have that feature. I really think it's something you should consider a little more. However, your game is already very impressive, and it's awesome as it is, without the upcoming Avalanche sequel and characters. Not having an upload/download function would make things a lot easier on our parts. A level editor is something we've truly wanted to do, as it goes with our philosophy of making games have high replay value. It's a Time and Difficulty vs Payoff sort of thing, though: we think that a majority of people on the iPhone wouldn't be interested in a level editor unless there was some sort of easy sharing function. Just try it. Start without sharing. You can add it in later. The levels are stored in the levels.db3 file correct? I'm guessing your iDevice is jailbroken GoombaWoot. Mine was until I updated to iOS4. Please email me the file. I just remembered that you could open the IPA in WinRAR and extract the contents. It would seem that you are right, GoombaWoot. "levels.db3" appears to contain all the levels. It is a SQLite 3 Database. I will look into this more. So my question is in regards to the new Zelda inspired game. Does it take place in the same universe as the Hookin games? Will we see any familiar places faces or references? The Zelda inspired game doesn't take place in the same universe, though most of our other games will. We'll probably have some references in the game, but they'll likely only be available as early buyer's bonus content.